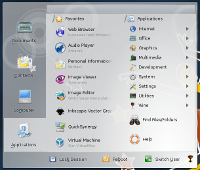 Lancelot is an application launcher menu (or ALI) for KDE Workspace designed to provide a place from which all your jobs begin. It provides quick access to applications, places, documents, contacts, and system information. It is Free/Libre Software published under GNU LGPL and GNU GPL. If you want a very powerful application launcher with more capability that the default one, use a launcher such as Lancelot. Yay for choice of application launchers. Yay for Lancelot. Ability to place parts of the Lancelot menu directly onto your desktop or panel just by drag and drop. At the moment, I (Ivan Čukić) am the only developer behind this project. Obviously, there are a lot of people involved indirectly - from other Plasma developers, to people who helped me find the answer to life, the universe, and everything. You can find me on IRC (#plasma channel) under a very obscure nickname - ivan|home (or ivan|away, or ivan|something else).